Torpedos, The Naval Military Munition, Derive Their Name From? There Is A Species Of Moth That Has Adapted To Living Entirely On What? Early torpedoes were slow moving but very powerful naval munitions that could glide through the water and, with a substantial burst of explosive energy, disable the ship they were launched at. As such, it’s only appropriate that their name is derived from the Torpedo genus of rays. 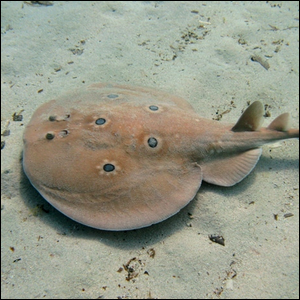 While slow moving, the bottom-dwelling rays in the Torpedo genus (better known as electric rays) have a body organ that functions like a battery, allowing them to discharge energy directly into their prey (or a predator) in order to paralyze and disable them–much like the munitions that bear their name “paralyze” the ships they strike. Image courtesy of Roberto Pillion.